Mark your calendars for the annual Christmas in Fallasburg party on Dec. 8 from 6 p.m. to 8 p.m. A $20 donation is requested to benefit the Fallasburg Historical Society. The party features a fancy buffet, beverages and music by Hawks & Owls. It is topped off by a bonfire. It is a once in a lifetime experience as you cross the Covered Bridge into the 1850s pioneer village. Thank you to all the volunteers and organizers who made the 24TH Annual Covered Bridge Bike Tour a smashing success. For doing your part to help preserve Historic Fallasburg Village with your registrations, thanks to all our riders, the largest turnout in several years. And, thanks to Mother Nature, you gave us the perfect day for everyone to explore some of West Michigan’s most beautiful scenery. As we closed up shop at the end of the event we had much to celebrate. Again, our gastronomical goodies from volunteers; the “cookie baker network” cookies and the culinary Italian Country-Style meal served al fresco from our Tuscan kitchens, set our bike tour apart. Not possible to walk away from us hungry! There were sore muscles that night amongst the tourers I’m sure, but no injuries-0. Two blown tires and a broken chain resulted in rides from our SAG Driver (Support and Guidance) back to Fallasburg Village mid-route for a handful. That was the worst of it. An earlier meal at the Fallasburg Village Cyclist’s Café the consequence. 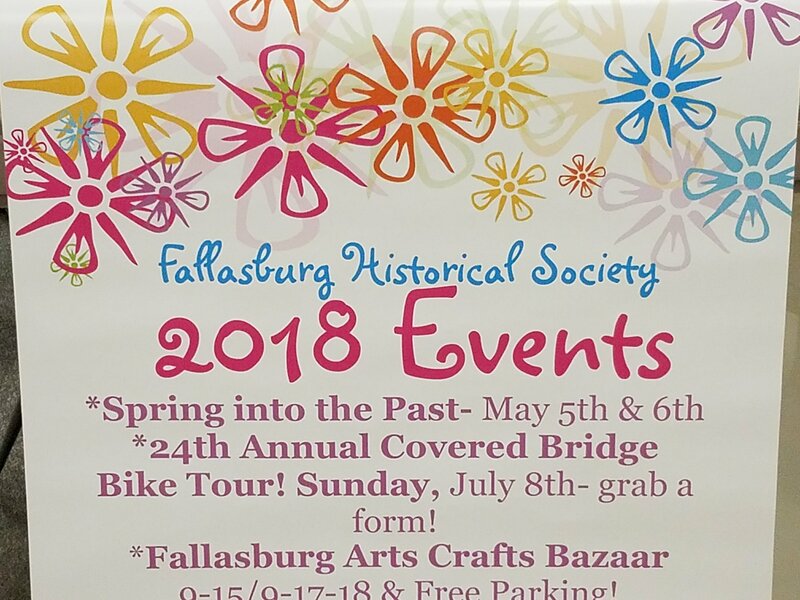 The Fallasburg Historical Society was pleased to contribute to the League of Michigan Bicyclists, “$1 Per Rider” program helping promote cycling in our State and make Michigan a safer place to cycle as we have since 2010. September and October are visitor favorites for fall color viewing in Fallasburg Village, and of special note are: Saturday & Sunday, September 15 & 16, and Saturday, October 27. Emma Palova will have a book signing of Shifting Sands Short Stories on Sept. 15 & Sept. 16 from 1 to 3 p.m. at the one-room schoolhouse. Come and chat with the Czech-born author about her book. You can buy your copy locally. Check EW Emma’s Writings at http://emmapalova.com for more info about the book signing. On Saturday, October 27th, “Boo”! It’s a “Ghost Walk.” The Fallasburg Historical Society will be hosting a paranormal investigation in collaboration with the Michigan Paranormal Alliance (MPA). Sign in begins at 6:30PM and runs to 7:00PM at the Fallasburg Schoolhouse. You will accompany MPA on your “Ghost Walk” from 7:00PM – 9:00PM to investigate/research 3 historic buildings and the Fallasburg Village Cemetery. We have less than 10 tickets left @ $40 each that include your research w/MPA, beverages/snacks, and an event t-shirt. Call 616-560-9109 for tickets. If you’re a “calendar marker, Saturday, December 8, 6:00PM-8:00PM, it’s “Christmas in Fallasburg”, A Community Celebration! Come for music and merriment at the Fallasburg Schoolhouse, finish in Fallas Field at the Fire! I share with you a communication we received that sums up the “Fallasburg Experience” whether serendipitous, or scheduled. Come for a visit and see for yourself! Thanks so much for all that you folks have done along the Flat River there in Fallasburg. My wife and I were trying to take a shortcut from I-96 to M91, and we found ourselves just north of Lowell, saw the signs, and thought, “Why not?” The park, bridge, historical community, and especially the road that lead us east out-of-town was the perfect unplanned way to slow down, enjoy, and spend a spring day in our area of Michigan. We eventually found our way to M91 and headed for home in Remus. But, whenever we have the chance, we’ll be sure to revisit Fallasburg again. Keep up the good work! BTW, I’m sending my $5 fine…I think I went faster than a walk! God bless. Join us for the 24rd Annual Covered Bridge Bike Tour! Pedal through the beautiful countryside at your own pace. Fallasburg historic village is located three miles north of Lowell, Michigan. Registration: At the school house from 7-9 a.m.
North approximately 3 miles to Fallasburg Park Drive. Right to entrance to park. Angle right on Covered Bridge Road. Over covered bridge to school house. Park in field across the street. *Look for county signs alerting you to the Park/Bridge/Historic Village. Please submit this form to register if you are not using Paypal. All participants must sign the release at the event. (See below.) Payment is for registration purposes only. Riding a bicycle on public streets can be dangerous to my personal safety. I will wear an ANSI or SNELL approved helmet during the tour. I will ride according to vehicle codes. The routes will be over public streets and road exposed to traffic. Some may have cracks, potholes, manhole covers, drainage gates, poorly-maintained railroad crossings, loose gravel, foreign objects and aggressive animals. I understand that none of the sponsors or organizers can guarantee my safety while participating in such an event. Parent/guardian signature required for applicants under 18 years. Riders under 16 years must be accompanied by an adult. By signing/submitting this form, I agree to release from liability the Fallasburg Historical Society, the organizers, the sponsors and the workers for any injuries or harm sustained as a participant in this tour. Please list rider names & ages. Fallasburg, MI – During the recent digital cataloging of Fallasburg artifacts, the historical team discovered forgotten treasures from Vergennes Township. The treasure hunters: Lisa Plank, Ken Tamke and Calvin intern Grace Bolt. These included a remarkable collection of Women’s Committee for the National Council of Defense index cards filled out by women from Vergennes Township in support of World War I in 1917. The Vergennes Township Clerk/Registrar was responsible for undertaking this survey and completing the index cards from women in the community. The collection includes many recognizable names in the community. Calvin College history intern Grace Bolt resumed the painstaking process of entering the data for Fallasburg artifacts at the Lowell Area Historical Museum (LAHM). She was working under the mentorship of Lisa Plank (LAHM) executive director and Ken Tamke, Fallasburg Historical Society (FHS) president for 14 weeks. This was the third year of digital cataloging of Fallasburg artifacts in cooperation with the Calvin College History Department. “I was familiar with the process of entering stuff like description, dimensions, pictures and saving it,” Bolt said. Bolt got hands on experience doing museum work as she helped to get the collection organized and to be a part of preserving history. The other great finds were Vergennes Women’s Cooperative yearbooks, Flaunting a forgotten era, old leather-bound property tax ledgers, accounting ledgers, and log books of school board minutes, some dating back to the late 1800s. The Vergennes Women’s Cooperative archives of yearbooks go back to 1850. FHS president Ken Tamke holds a box with Women’s Cooperative yearbooks. “It’s a valuable cache of Vergennes Township history,” said Tamke. These items were stored in the basement of the Misner House. They sat there until 2007 or 2008, safe, but not in a climate controlled environment. Now, the historical treasures will remain in a climate controlled environment stored in proper boxes. Plank said it was an opportunity for Fallasburg to get their collections organized. Both FHS and LAHM with digital cataloging have more resources available now. The largest collection of the WWI support cards is at the Greater Grand Rapids Women’s History Council. The Fallasburg Historical Museum, the one-room schoolhouse opens for the season on June 3rd from 2 to 4 p.m. Plan your visit today.